Musgrave was also designated MS 4 and assumed the EV 2 and IV 2 role for the mission's EVA programme. His primary crew responsibilities also included the galley on the mid-deck, 35 mm photographic equipment, medical issues, on-orbit stowage, and FDF issues concerning EVA. His back-up crew responsibilities included the Hubble Space Telescope, payload communications, 70 mm photographic equipment, in-flight maintenance, dealing with the Public Affairs Office and flight plan issues in the FDF. For STS-61, there were 105 EVA-related training tasks. As a crew, the five EVA astronauts logged 350 hours in total in the water tanks at Houston and Marshall, setting a new crew record. 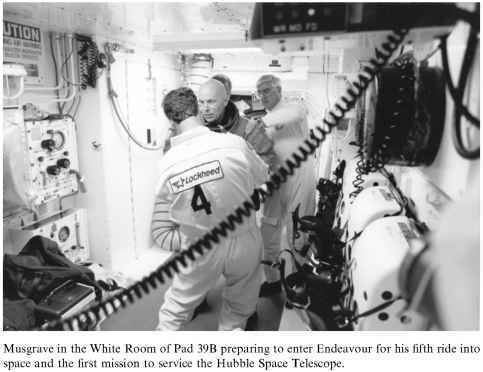 Musgrave in the White Room of Pad 39B preparing to enter Endeavour for his fifth ride into space and the first mission to service the Hubble Space Telescope. in Thermal Vacuum Chamber B at JSC. In wanting to maximise his training time during one session in the chamber, he suffered a mild case of frostbite in his right-hand fingers through his EVA gloves, as the chamber was cooled to minus 130 degrees. During the equipment test, he had been practising with the tools and other instruments he would use during the EVAs on the mission. He communicated that his hand felt cold during the eight-hour simulation, but elected to complete the chamber run. After leaving the chamber and taking off his suit, Musgrave reported numbness and discolouration of the fingers. Under examination from NASA physicians, he began appropriate therapy to improve the condition as quickly as possible. 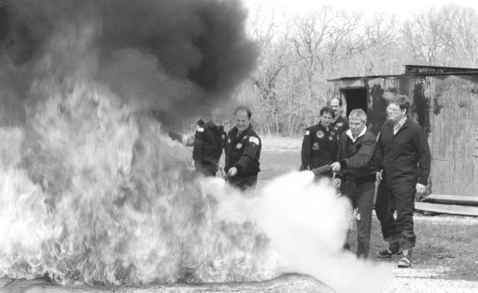 Fortunately this had no lasting impact on his mission training or his assignment to STS-61.